Golf in Bulgaria means a great deal more than only hitting a small white ball over a long distance and aiming at a little tiny hole. Golf in Bulgaria is very attractive, because of the region and the way the courses are implemented in the nature. Golf in Bulgaria also means that a person can enjoy brand new signature golf courses, which do not only impress with their playing philosophy,but mostly by their quality and accessibility.This package includes golfing on 2 signature goulf courses near by the Bulgarian capital Sofia : St Sofia Golf Course and Pravets Golf Course. St. Sofia Golf Club & SPA is located just 25 minutes from Sofia city center. It hosts an 18 holes golf course designed by Paul McGinley, a golf academy, a football field, two petanque and croquet fields, professional golf shop, stylish restaurant, vitamin bar, lobby bar, conference hall and SPA with an indoor/outdoor mineral pool. The golf course was opened in 2004. Few years after the courses was re-designed by the famous Irish golfer Paul McGinley. In May 2012 the course was reopened. The Capital Sofia now has a golf course that sits proudly alongside other European Cities. The Club house is built in colonial style and its broad terraces reveals a magnificent view over the golf course and Vitosha Mountain. The beautiful panoramic view over the stunning sunsets is combined with exquisite drinks, international and local cuisine and an excellent service. The Vitamin Bar ‘19th Hole’ is a natural extension of the intriguing golf game. Restaurant&Lobby bar is much more than an F&B location, it’s aboutentertainment gastronomy, a stylish venue to meet friends or business partners. The SPA has massage room, ozone bath, compact hot zone (with steam bath, Finnish sauna 90 degrees, Herbal sauna 60 degrees and ice room) and a swimming pool with mineral water. The fitness center is at the disposal of those who want to continue the exercises for fit body and good shape. The golf course in Pravets is part of the hotel Spa complex RIU Pravets Resort Golf & SPA, which is situated at the foot of Stara Planina mountain and built around the famous lake, 40 minutes away from the capital Sofia. Pravets Golf Club is managed by Braemar Golf, St Andrews Scotland (UK). Golf offers a Peter Harradine designed 18-hole, par 72, Championship golf course of 6469 m length, State-Of-The-Art golf academy and an extensive practice area. The signature hole of Golf Club “Pravets” is hole number 8, par 3. Its green is an island and is situated in the middle of a lake with a unique design for the country. Hole number 15, par 4, includes the water of the big lake as a hazard. 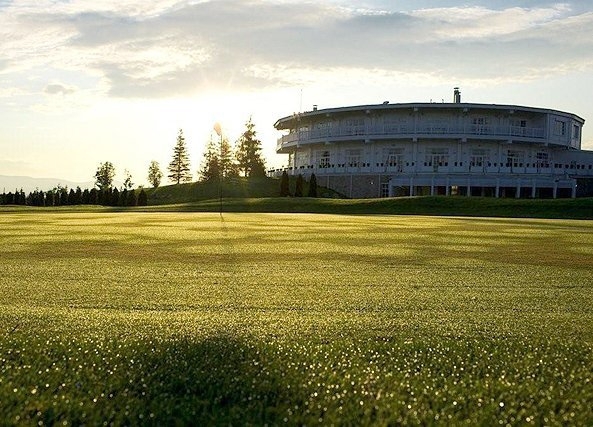 In 2011 , in 2012 and in 2013, Pravets Golf Club hosted the UniCredit PGA Championship of Europe. The hotel is located just a 25-minute ride away from Sofia city center, between the mountain ranges of Stara Planina and Sredna Gora and overlooking the golf course, St. Sofia Golf Club & SPA Hotel on the top floor of the clubhouse, has five very comfortable and cozy double rooms and an elegant President suite. On their last day, the client can choose where they want to play – at St.Sofia or at Pravets.